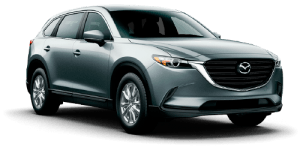 The all-new Mazda CX-9 takes the three-row, family crossover SUV into fresh territory. Crafted for exceptional handling and with best-in-class fuel economy†, this is one SUV you’ll love to drive. Add stunning KODO “Soul of Motion” design that artfully takes into account the smallest practical details and fluid seating and cargo options, and your everyday driving experience just got a whole lot better. Three rows. Seven seats. Countless memories: More second- and third-row legroom than the Toyota Highlander. Real-world driving performance: SKYACTIV-G 2.5 T Dynamic Pressure Turbo engine delivers more power when you need it most. Three-Row Seating: You’re on the go and you need a vehicle that can keep up. Three versatile rows have you, your passengers and your cargo needs fully covered. 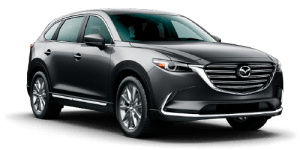 SKYACTIV-G 2.5 T Dynamic Pressure Turbo engine: The CX9’s 310 torque at 2,000 rpm serves up best-in-class standard torque with a higher level of power at lower levels of rpm – substantially more than the Infiniti QX60 and Acura MDX. AWD that responds to your environment. With i-ACTIV AWD, a multitude of sensors monitor operating conditions to help predict when AWD might be needed before the wheels slip. A safe haven in a hectic world. 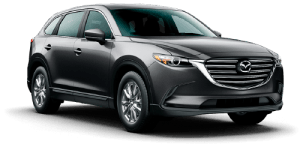 Protect your precious cargo with the CX-9’s comprehensive matrix of safety features, including the available i-ACTIVSENSE safety technologies that help predict hazards on the road. Custom-built for the CX-9, we worked with Bose to devise a system that considered hundreds of factors, from cabin size and materials to seat positioning and the unique sound variances of today’s digital devices. The result is outstanding clarity, image and range.